Do you get online and compare yourself to the rockstars of your world? (However you define “your world,” be it a profession or a sport or what have you.) And end up feeling discouraged? When I hear of someone who’s growing all their own food, including fruit trees and other higher-gradient stuff, and making a whole homecooked meal from their garden (and maybe even raising the trees to produce the wood that they then make into charcoal for their grill — that was a fictitious example to inject humor into my case of “Martha-Stewart-itis of food gardening”, but I’m sure such people are out there doing that! ), sometimes I just want to cry and give up. But I have no wish to give up! So I persist in my efforts to learn and grow from where I’m at right now. Though my successes have been modest at best, I have expanded my repertoire and ended up producing some delicious nutritious food, even when my “yard” was just a couple of pots, or a piece of ground no bigger than a table. • Learn your local edible “weeds” and wild plants. First and foremost on my list of gardening tips, find the food that you don’t actually have to garden because it grows for free! It’s shocking how much of what we consider “weeds” is edible, nutritious, and tasty. And it grows lush and stout with no artificial irrigation or other human intervention! If you’re willing to have a yard that changes with the seasons, you can have fresh wild greens for many months of the year or even year-round in some places. No yard? No problem — forage! Even in urban areas a huge amount of fresh food is growing. Go on a “weed walk” or workshop with a local expert; also consult the guides published by your local native plant society. • Container gardening. No yard? No problem! I was amazed at how much can fit into a container garden. 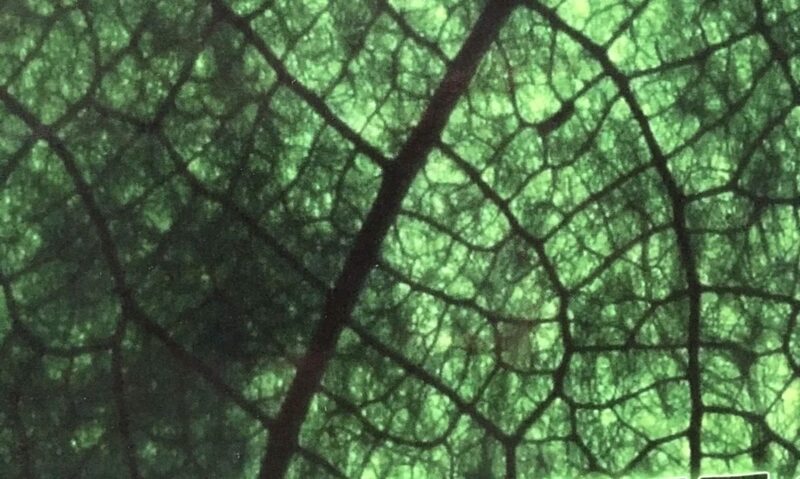 I had four kinds of delicious greens growing in a pot at my home in an RV park where I lived in Austin, Texas. At the moment I have about a hundred tiny papaya tree seedlings sprouted in two pots. • Make friends with your local nursery. Buy seeds from them, but also, look into their selection of veggie seedlings. Starts from a nursery were a goddess-send to me when I was first getting started, and I still rely on them quite a bit. Baby plants from your local nursery are more likely to be locally started and cultivated than starts you purchase from a big-box store, which may have been trucked in from thousands of miles away (and therefore, in addition to being weakened by long-distance transport, will not be as well-adapted to local conditions). Also, your local nursery offers “homegrown” expertise and customer service. NOTE: If you’re going to pick your local grower’s brains, be sure and buy from them too! Don’t ask them a bunch of questions and then use that expert info to buy from a big-box store. • Get on the internet! Local gardening groups; Google; YouTube. You might be surprised — even many of my skilled gardener friends are not too proud to google for details on (for example) how to plant a mango seed! • Use your local ag university; county ag extension office. UF-IFAS here in Florida produces a wealth of information including the spectacularly useful graphics shown in this picture; there’s probably something similar in your area. Your tax dollars are helping to pay for it; make use of it! • Love Thy Neighbor! Connect with your neighbors who garden. Oftentimes they will have surplus seedlings they’re trying to give away. (And they might have produce they want to share rather than have it go bad.) Accept their offers to share the bounty (which might include their expertise — gardeners tend to be generous that way). • Talk to strangers! As they say, a stranger is just a friend you haven’t met yet. See a fruit tree in someone’s front yard? Knock on the door and ask if you can pick some. I saw an orange tree growing in a yard, knocked on the door. When the guy told me sure but warned me that the fruit was bitter, I informed him I wanted to make marmalade, and I offered to drop off a jar for him when I had made some (which I did, subsequently). It’s not growing food per se but it is growing community … which can lead to growing food. • Work on a farm! Back when I was living in Austin, I was fortunate to have several small organic farms within bicycling distance of my urban home. I worked as a volunteer for a couple of summers on one of those farms. In exchange for my labor-hours, I got knowledge, experience, and all the fresh peak-of-season produce I could take home. • Meet those “Martha Stewarts”! Those food-growing superhumans, those horticultural Martha Stewarts whose Facebook posts make me want to cry and give up … turns out they tend to be extremely generous and eager to share tips and knowledge. They love growing food, they care about the environment, and they WANT everyone to be able to do the same. Connect with them on social media or in your neighborhood. • The more the merrier! Community gardens are a great way to get started. If there’s one near you, get involved as a volunteer/helper for others even if you prefer to have your own garden at your own home. In some places, Master Gardeners volunteer huge amounts of their time and expertise to shepherd users through every step of the process. Take advantage of this pool of expertise, as well as the shared tools and the morale-boosting face-to-face company. • Don’t fight nature. Don’t try to garden in the hardest season, whatever that is for your area. Here in Florida where I live, summer is the hard season. Or if you have to garden in the hard season, at least don’t beat yourself up or think it’s reflective of you if your efforts don’t bear much “fruit” (or veggies). This took me a long time to learn! I finally realized I was trying to garden during the hottest time in Florida, when even some experienced gardeners and farmers give it a rest. • Sprout it out! Bean sprouts are easy to grow. Many kinds of beans will sprout in a jar. I’ve had the most luck with mung beans and lentils, both purchased from my local Asian market (though ones from the regular supermarket have worked also). Simply get a large mason jar, pour some dried beans in. Don’t fill it too full; less than a quarter full is good. Add water and let the beans soak overnight or for 8 hours. Drain off the excess water. From then on, rinse the sprouts once or twice a day. You’ll have nutritious sprouts for days! Sprouts are tasty, nutritious, cheap food you can grow even if you live in a high-rise apartment with no windows or balconies. I’ve even taken them, in the jar, on business trips as travel food. • Infographics on “What to Plant for Each Month.” This website is for Florida, but you might have one for your state too. This page is part of the Gardening Solutions website. 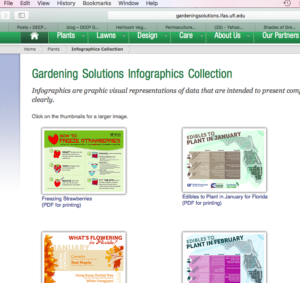 Gardening Solutions is a program of the University of Florida’s Institute of Food and Agricultural Sciences (UF/IFAS). I am bowled over at the free public resources that exist. There is support on many levels for food-growing. • Nice article in Mother Earth News, on the distinction between hybrid, heirloom, and open-pollinated seeds.